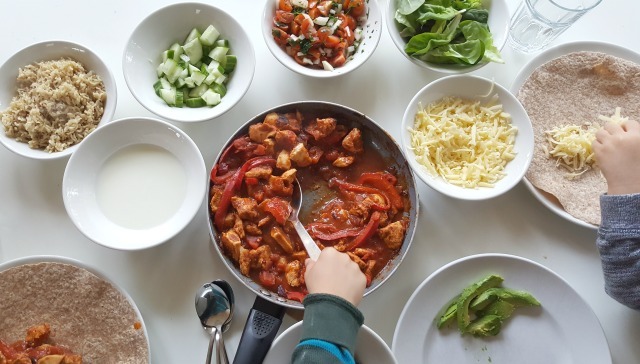 Sometimes I love cooking, and sometimes it feels like such a chore, but I love trying new recipes, and want the boys to regularly try new foods. Otto can’t last much later than 5pm, so since he started weaning, I’ve had to be more organised with family meals. In the past it would get to almost 5pm, and I’d leisurely make something for the four of us. I loved a post by Helen over at Treasure Every Moment, and thought it would be fun to do the same. 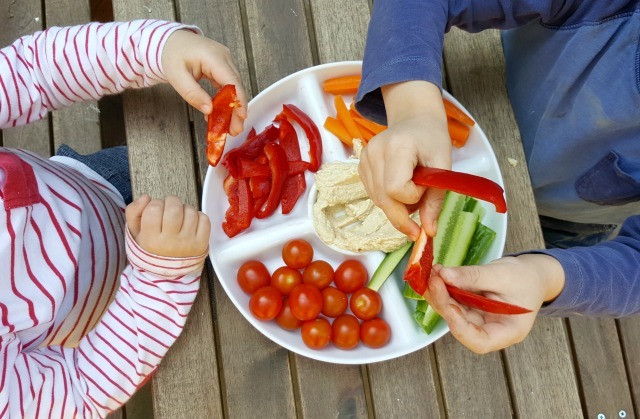 Maybe it’s because I love food, but I love hearing about what other people are eating, especially when young children are going to be eating it. All three boys are pretty good eaters. They all have a few things that they won’t touch, which I get them to retry every so often. Their cousins happily scoff olives and avocado, but they are both a total no-no with all three of mine. Win is better with raw veggies, whereas Ru is a cooked greens eating machine. After playgroup on a Tuesday afternoon as O naps, I normally do some form of meal prep for the rest of the week. It could be making the base for a sauce, putting a meal in the freezer, or chopping some veggies. I don’t eat red meat, so I rarely cook with it. Jared really enjoys sausages, or spaghetti bolognese every so often, which he makes for himself. Day to day, we eat mostly vegetarian, with a few chicken and fish dishes. 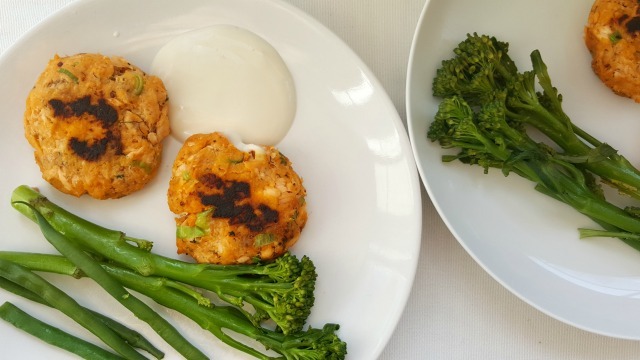 Salmon fish cakes and greens. This is a recipe from Fearne Cotton’s ‘Cook Happy, Cook Healthy’, and the boys would eat them every day if they could. We usually have them with broccoli and green beans, with a dollop of natural yoghurt mixed with lemon juice. ‘Dip dip’ is still very popular as a lunch option. Soup and bread is a classic in our house. All three boys love it, and they’re not fussy about what it contains. This was a vegetable one because I needed to us up fridge leftovers. I don’t know what it is about fajitas, but they always feel pretty exciting. Every so often I really crave them, and I love putting all the extras in bowls for the boys to serve themselves. 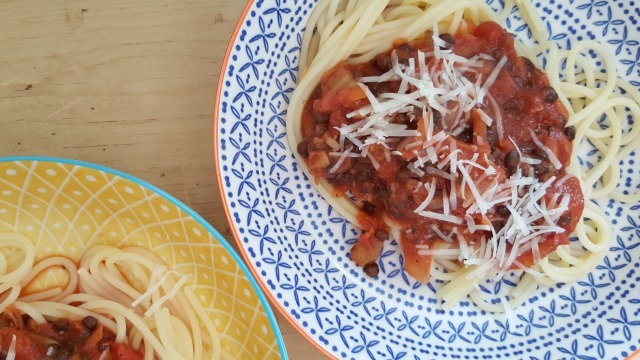 Lentil bolognese with spaghetti and parmesan – lots of veggies (this one is onion, garlic, mushroom, courgette, carrot and celery, but it depends what I have in the fridge), lentils (puy or red), herbs and chopped tomatoes whacked together in a pan. 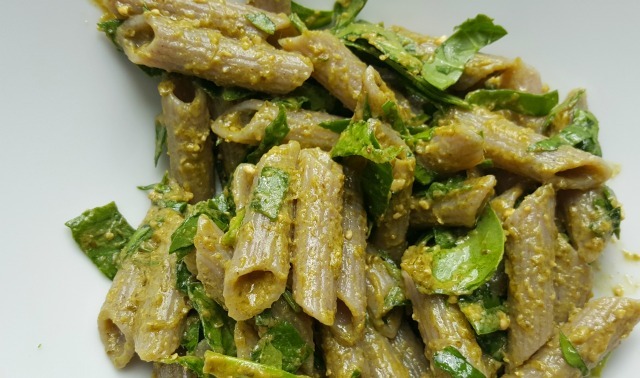 Pesto pasta, my ultimate lazy lunch or dinner, and the kids love it. Usually I stir in some vegetables to add some goodness. 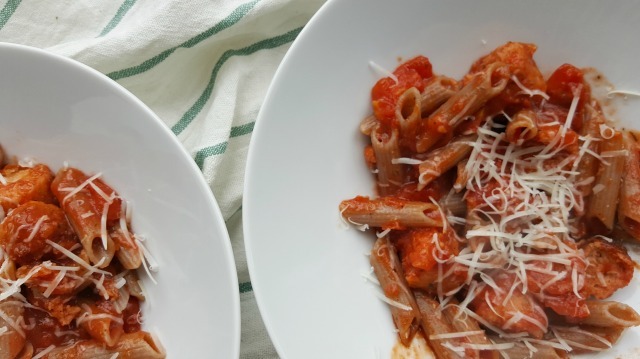 Another pasta variation we love is veggie sausages in a tomato based sauce, or tuna pasta. 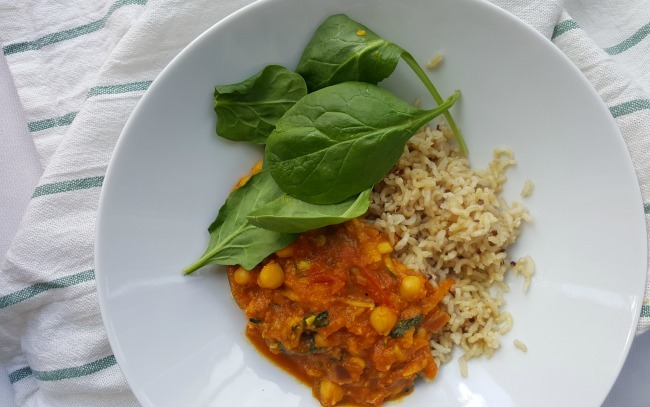 Chick pea curry with rice and greens. Win especially likes curry, and copes much better than Jared with spice. Lentil curry, thai curry, tikka masala and kashmiri curry are a few others that we love. 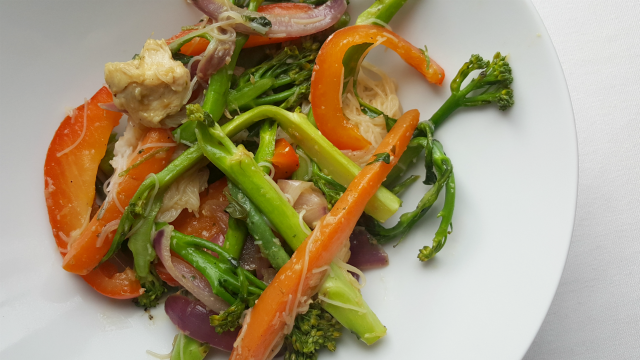 Stir fry with toasted cashews and vermicelli noodles. Sometime we have this with chicken or prawns, but often we have it meat free with just toasted cashews. It’s flavoured with garlic, chilli, ginger, fresh coriander and tamari. Win and Ru both love having a go with chop sticks. 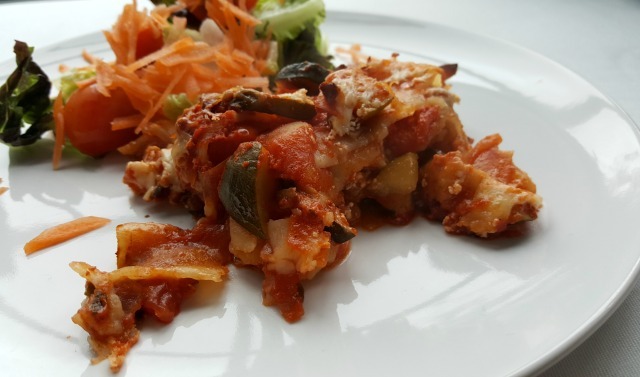 Vegetable lasagne. I really need to find a recipe for this and stick to it. Sometimes my veggie lasagne tastes amazing, and other times it tastes dry and tasteless. It’s a family favourite…when I get it right. Jacket potatoes with tuna, cheese and beans. This is a really quick dinner or lunch, that we don’t have often enough. I mix the tuna with natural yoghurt, lemon juice and pepper. Up until a few months ago Win didn’t like potatoes or cheese, but he has been desperate to like them, and finally he does. A mini triumph! Next – scrambled eggs. 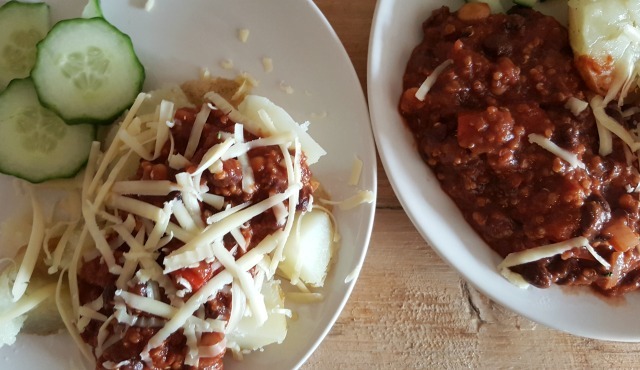 Bean chilli, usually with rice, but sometimes with a jacket potato. 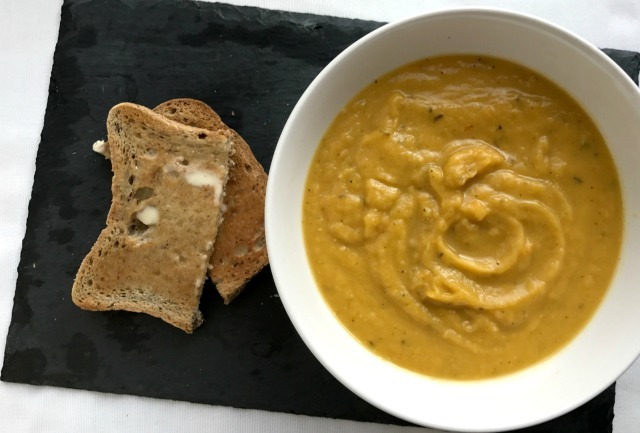 The recipe I use is from ‘A modern way to eat’ and it’s really delicious. The base is black beans, puy lentils, quinoa and chopped tomatoes. Salmon and greens. This is so simple and the boys love it. 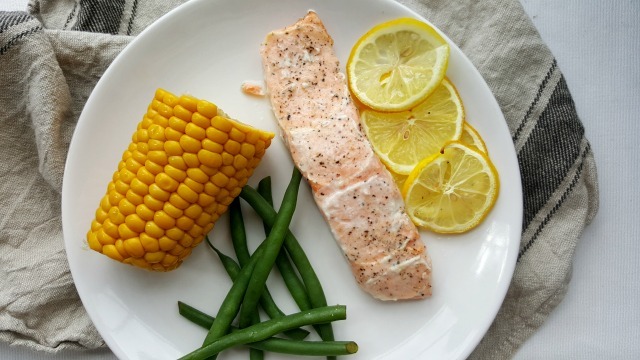 I always season our salmon with dill, lemon, paprika, salt and pepper. 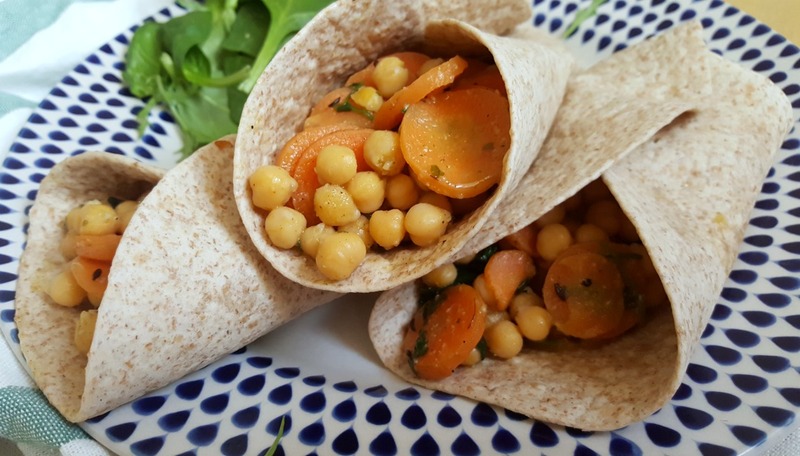 Chick pea wraps are a meat free spin on fajitas, and you can find the recipe here. Falafel and houmous wraps are also delicious. 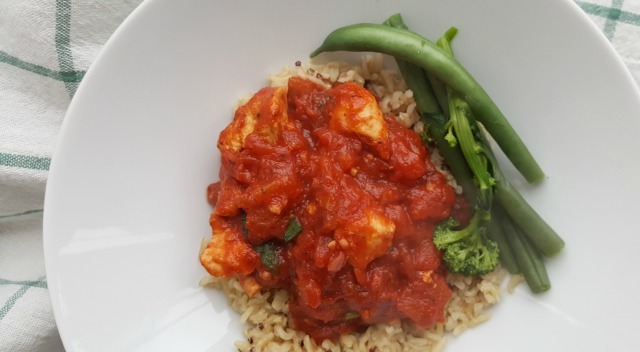 Chicken, tomato and basil with rice and green beans. I don’t know where this recipe came from, but it is what I make when there isn’t much left in the house. The sauce is onion, garlic, chicken, basil, chopped tomatoes, salt and pepper. 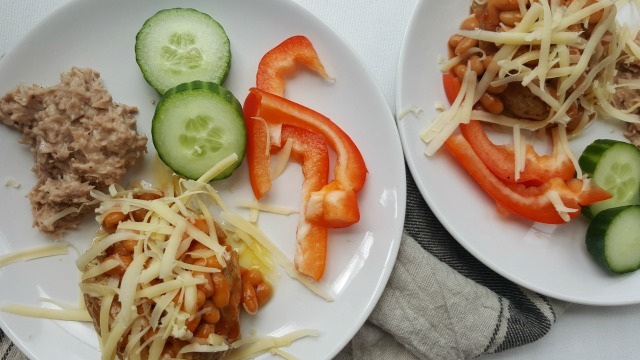 Ooh lovely some brilliant veggie ideas, thank you! We eat mostly vegetarian too as I’m veggie and I do the cooking! By the way, do you shop at Morrison’s? I only ask because I notice your green beans and they’ve had a product recall on them today as there were needles found in the green beans. I LOVE this post Esther! I’m totally bookmarking it! We’ve been on a bit of a journey this year, trying to eat more whole, healthy and organic meals, and while we are meat-eaters, I’m trying to cook at least two veggie meals a week. I am totally nicking some of these recipes! Thanks for sharing!